Brighton Ford : Lucky The Lovable Cat, Brighton Ford's Pet Of The Week! Lucky The Lovable Cat, Brighton Ford's Pet Of The Week! 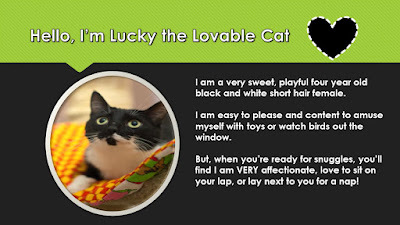 Introducing Lucky, the lovable cat, Brighton Ford's pet of the week! Lucky is a very sweet, playful four year old female cat that is easy to amuse with toys or birds out the window. She's a very affectionate cat looking for her furever home in a house with no other pets. Click here for more information on Lucky the lovable cat or contact the HSLC's Adoption Counselors via email at pets@humane-livingston.org for more information about this pet.